Why are you taking radiographs of my pet's teeth? The doctors of Kitsap Veterinary Hospital are continually striving to improve their knowledge and skills to better serve your pet’s health. Recently, our entire staff attended a veterinary dental seminar to learn the best ways to treat and prevent oral disease in our patients. What we discovered is that we have already been doing an amazing job of proactively recommending oral health care, and we will continue to advocate for the best treatment and prevention of disease in your pet’s mouth. With that in mind, and based on recommendations from the Academy of Veterinary Dentistry and the American Animal Hospital Association, we are now implementing full mouth dental radiographs as part of every comprehensive oral health treatment. Comprehensive oral health treatment is performed with the patient under general anesthesia and involves a thorough examination and any necessary treatment of the structures in the mouth. Typically this includes cleaning and polishing of the teeth crowns and the surfaces just beneath the gum line. If disease processes such as periodontal bone loss or abscesses are present, oral surgery may also be performed to extract unhealthy teeth. Our goal is not only to treat areas of disease, but also to prevent unnecessary tooth loss when possible. By taking full mouth radiographs, we are better able to assess the overall condition of the mouth and each individual tooth. 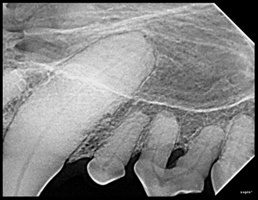 It allows the veterinarian to visualize structures that are covered by gingiva (gum tissue) and cannot otherwise be examined. This information is important in formulating a plan for treatment. 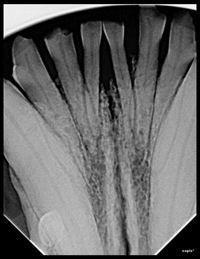 Some conditions that are diagnosed with dental radiographs include root abscesses, periodontal bone loss, root fracture, missing teeth, impacted teeth, pulpitis (dead tooth), and cancer.